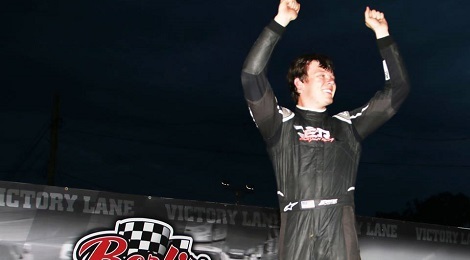 MARNE, Mich. — For the second year in a row, Erik Jones used an emotional fire to fuel his victory in the ARCA/CRA Super Series’ Battle at Berlin 251 presented by Primera Plastics on Monday night at Berlin Raceway. Last year, it was a car destroyed in qualifying and an all-nighter spent resurrecting an old car that ultimately pushed the Byron, Michigan native to the win. This year, it was the loss of his father after a hard-fought battle with cancer, and what some might call divine intervention, that offered the final push Jones needed to bring home a touching trophy for he and his family. He took the lead on lap 194 from super late model veteran and three-time ARCA/CRA champion Johnny VanDoorn and never looked back, topping the final 58 circuits – including the entire 51-lap closing segment – to score his sixth-career series victory. Jones’ win in the 251 a year ago sparked his eventual run to the JEGS Super Late Model Triple Crown, where he scored a $100,000 bonus. All six of Jones’ ARCA/CRA super late model wins have come in legs of the Triple Crown, including three Winchester 400s, the RedBud 300 and now, his second Battle at Berlin 251. But it meant even more than just that, as Jones sought to honor his late father Dave – affectionately known as Papa Bear to the team – with a victory that the pair celebrated together just a year ago at their home race track. And in the end, he did just that. Qualifying kicked off the night under threatening skies, with Boca Raton, Florida’s Dalton Sargeant the early pacesetter until Quinnton Bear knocked him off the top spot. However, it was the very last car – Senoia, Georgia stalwart Bubba Pollard – who set the fast time with a clip of 15.751 seconds (99.994 mph) around the seven-sixteenths-mile oval. The race got off to a rocky start, marred by several early cautions, while Pollard and Jones stormed off to the early lead before Pollard tried his best to march away in the early going. However, Johnny VanDoorn stormed up from ninth on the grid to take the lead for the first time on lap 46, and looked for the large part of the race to have the car to beat. Eight laps after VanDoorn took the lead, the red flag was out for oil clean up after Brandon Oakley lost a motor. On the ensuing restart, VanDoorn and track legend Tim DeVos swapped the lead a few times until Pollard snuck by DeVos to join the fray.